Cells in your body react to everything that your mind says, Happy mind – Happy body, Troubled mind – Troubled body. I was impressed reading this article stating the effectiveness of mindfulness in managing depression. It is worth reading. Autistic children endure more and face more challenges every day, every week, every year of their life than most of us will ever do in our entire lives. Loving your child is more important than medicine, therapy or anything else. 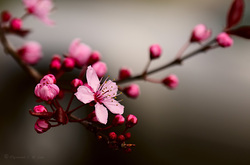 Cherry blossoms symbolize the extreme beauty that is representative of the beauty in each of us and the innate desire to beautify the world around us.